For many years William Docken faithfully served the men and women of IACIS, both as a pioneer member and as an elected official on the Board of Directors. To those that were fortunate to know him, he was known only as “Will”. After Will’s retirement as a Special Agent from the United States Customs Department, he invested his time and energy into giving back to the forensic community he so dearly loved. Will spent a considerable amount of his time providing his forensic expertise and assistance to those smaller departments that had little or no computer forensic support of their own. William John Docken was born Nov. 11, 1949, in La Crosse. After growing up in rural Galesville, Will graduated from Gale-Ettrick High School in 1968. Will married Vickie Oanes on June 19, 1970. He attended and graduated from UW-Platteville in 1973 with a degree in Criminal Justice. His career in law enforcement included working for the Lafayette County Sheriff’s Department, the Platteville Police Department, the Federal Internal Revenue Service and U.S. Customs. In 1991 Will was one of the first law enforcement officers in the United States trained in computer forensics. Will held a charter, lifetime membership in the International Association of Computer Investigative Specialists and served on the Board of Directors for the Forensic Association of Computer Technologists. After retiring from Law Enforcement, Will continued to do Computer Forensics with Will Docken Investigations. 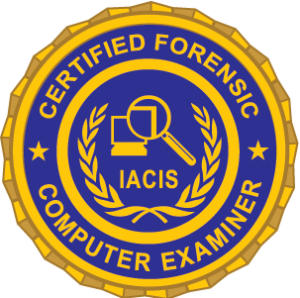 In memory of Will’s selfless devotion to the field of computer forensics, the IACIS Board of Directors unanimously supported honoring the memory of our former director and longtime friend through the creation of a scholarship to attend the IACIS Basic Computer Forensic Examiner (BCFE) training course. To continue the work Will started, one scholarship will be awarded annually to attend the BCFE training event held in the United States. The annual scholarship recipient will have the course tuition fees waived and will be furnished all of the course materials, equipment and hotel accommodations at no cost. In past years the scholarship recipient was required to provide their own meals and transportation to and from the event. This year three entities provided the funds to cover the recipient’s travel costs. The airfare was paid for by Digital Intelligence, the per diem was provided by FACT funds and the hotel cost was covered by the Royal Caribe Hotel. To qualify for the scholarship, applicants for this scholarship must be employed by a law enforcement agency to conduct digital forensic examinations. Additionally, the agency cannot have more than two personnel assigned to conduct digital forensic examinations. Applications are accepted from September 1st through December 31st, 2018. No later than February 1, 2019, a drawing will be held from eligible applications. The successful Applicant and her/his agency will be informed via e-mail.